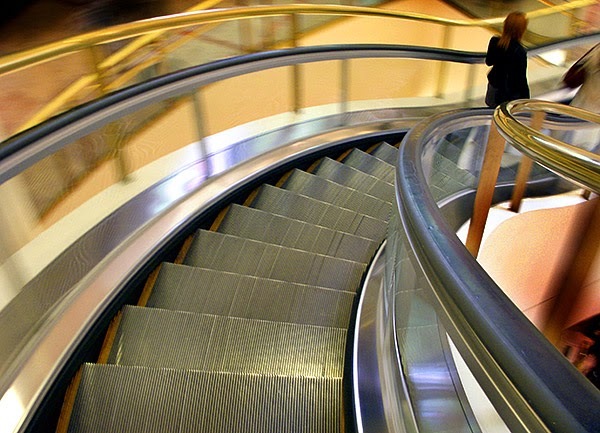 Dunbar and Boardman: Curved escalators: Who made the first one? Curved escalators exist now. They are still relatively rare and are often provoke wonder and awe when the general public first encounters them. Many are justifiably regarded as tourist attractions in their own right as they're often visually more appealing than linear escalators and perhaps more in keeping with the luxurious settings they often become part of. There are curved escalators in hotels, casinos and upscale shopping malls around the world. Curved escalators: How do they work? Curved or spiral escalators present new engineering challenges compared to linear escalators. They do take up less floor space but need to be assembled on site. Key challenges include the curvature of the steps and the returning steps back under escalator. One company has mastered this and refers to their pioneering technology but more on them shortly. Who built the first curved escalator? In 1985 Mitsubishi Electric installed the world's first practical spiral escalator in Osaka, Japan and began building curved or spiral escalators on a regular basis and it is they who dominate the curved or spiral escalator market today however, it is not Mitsubishi who built the first curved escalator. So who did? The first curved escalator was built by Jesse Wilford Reno in 1906 and installed briefly at Holloway Station on the London Underground. Reno was the inventor of the escalator having built the first working escalator in New York’s Coney Island in 1891. 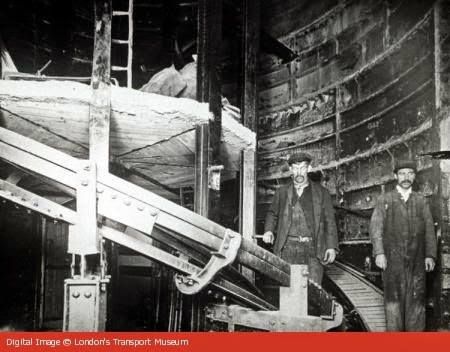 The curved escalator at Holloway Road was removed shortly after installation and never used by the public. The spiral escalator was not a successful experiment. The photograph below was taken before it was removed. There has been a lot of progress since Reno’s day and now curved escalators manufactured by Mitsubishi can be found at the following locations: San Francisco Centre, San Francisco, Canada’s River Rock Casino Resort, Wheelock Place in Singapore, Saudi Arabia’s Jeddah Hilton, The Landmark Tower in Japan, the Times Square shopping mall in Hong Kong, Lotte World in South Korea, The Venetian Hotel and Casino in Macau, Wynn Las Vegas and The Forum Shops at Caesars in Las Vegas, Nevada. In conclusion these machines can only be deployed it situations where money is no object as there are very costly when compared to conventional escalators in conjunction with ongoing maintenance and support over the life of the equipment. In the UK, the Levytator was created in 2010 and launched with much publicity heralding it as the first free-form curved escalator. The Levytator is capable of following freeform curves, achieved by replacing the traditional rectangular steps with curved modules that also allows the modules to be placed in a continuous loop. You can see a demonstration of the Levytator here. Dunbar and Boardman is the lift, escalator and access equipment consultancy. Do you have a current or planned project that includes escalators? Curved or linear? We would be happy to discuss any such requirements and how we may be able to assist. Give us a call on T +44 (0) 20 7739 5093 or send us an email via peterboardman@dunbarboardman.com to start the conversation. We look forward to hearing from you.